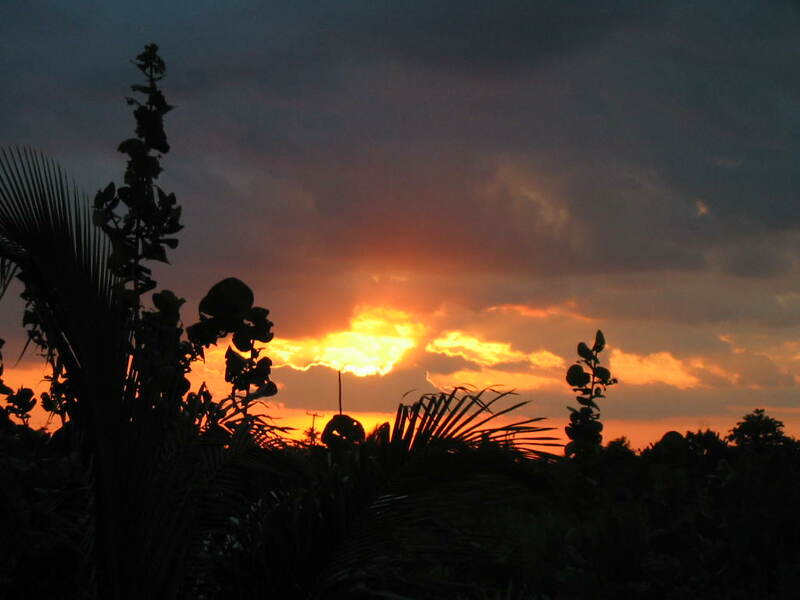 Belize NMS: Mainly fair conditions will prevail today, then an increase in moisture is expected later tonight and tomorrow. 24-hour forecast: Mostly sunny with isolated showers or isolate thunderstorms inland this afternoon, then cloudy at times tonight with a few showers and isolated thunderstorms mostly over southern and some coastal areas. General Outlook: Some cloudy spells with a few showers and thunderstorms over most areas during Sunday then mostly over the south and along some coastal areas Sunday night. Daily Tropical Weather Outlook: At 3:00am Tropical Storm Harvey was centered near latitude 13.8N, longitude 65.9W or about 235 miles ENE of Curacao. Harvey was moving to the West at 21 mph with maximum sustained winds of 40 mph. Today E-NE 5-15 kts Light Chop 1-3 ft ISOLATED SHOWERS OR ISOLATED THUNDERSTORMS. Tonight NE 5-15 kts Light Chop 1-3 ft A FEW SHOWERS AND ISOLATED THUNDERSTORMS MOSTLY SOUTH. Tomorrow NE-E 5-10 kts Light Chop 1-3 ft A FEW SHOWERS AND THUNDERSTORMS. Outlook NE 5-10 kts Slight 1-2 ft SHOWERS AND THUNDERSTORMS DECREASING. For more on Tropical Storm Harvey, CLICK HERE. On Ambergris Caye this morning at 5:35 I took this photo, oddly it's a sunny day now at 7:30 and the sea is flat calm with a light breeze from the North. 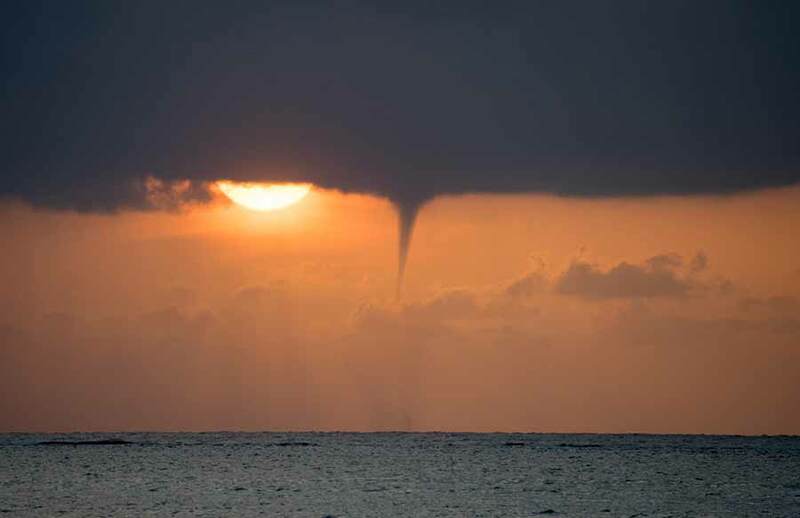 Water spouts are fascinating to me. Our expected high is 88 f.
WOWIE --- I was awake but inside and missed this spectacular show. Thanks for the photo!!! 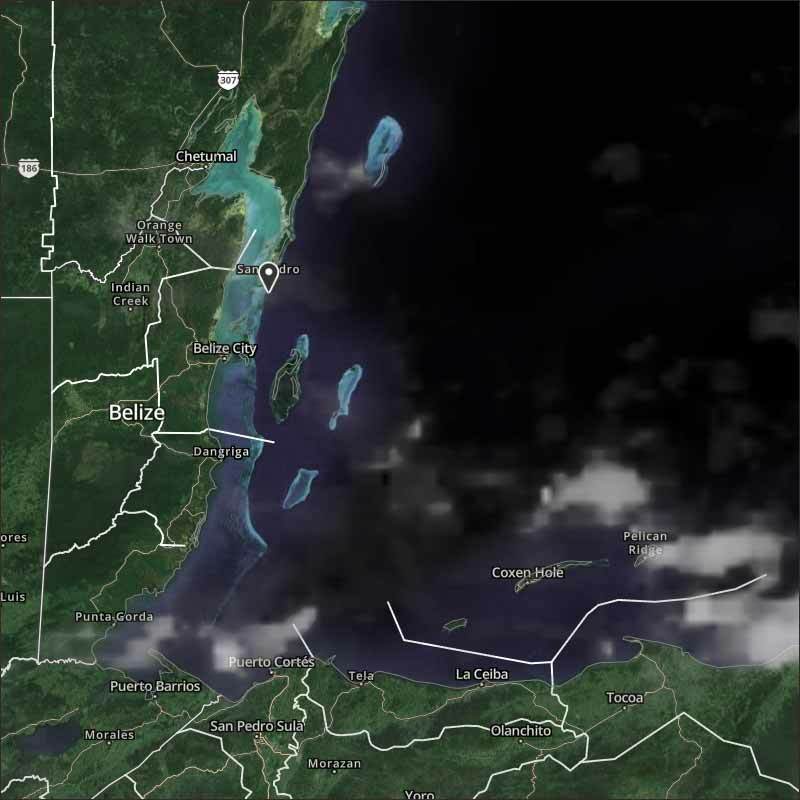 The local winds continue to come down from the NE, bringing some overcast cloud, but the high level is actually going away from Belize, with some rain out at sea. Looks like today is sunny in parts of north and south, but overcast in central, but will become sunny later, probably little or no rain.